Most likely you have a ‘safe deposit locker’ with a bank … depending on the valuables that you have – you might chose to rent a bigger sized one (may be some require a room and not a box !) ~ and ever wondered whether the terminology ‘rent a locker’ is right ? A safe deposit box, (not a safety deposit box) - is an individually secured container, usually held within a larger safe or bank vault. Safe deposit boxes are generally located in banks, post offices or other institutions. Safe deposit boxes are used to store valuable possessions, (Gold, silver, diamond ornaments ….) precious metals, currency, marketable securities, important documents such as wills, property deeds, - things that need protection from theft, fire, flood, tampering, or other perils. Though the banks collect ‘rent’ – ‘safe deposit charges’ (earlier they used to insist on Fixed deposits being kept) – RBI circular clarifies that the relationship between the bank and the locker hirer is in the nature of a 'bailor and bailee' and not 'landlord and tenant'. The bank at all point of time, has no knowledge of the contents of the locker and the bank is required to exercise due care and necessary precaution for the protection of the lockers provided to the customer. The lockers come in various hues – they are strong, impregnable; mostly airconditioned …. Under guard …. Still one needs to realize that in some ways this is no protection at all….. 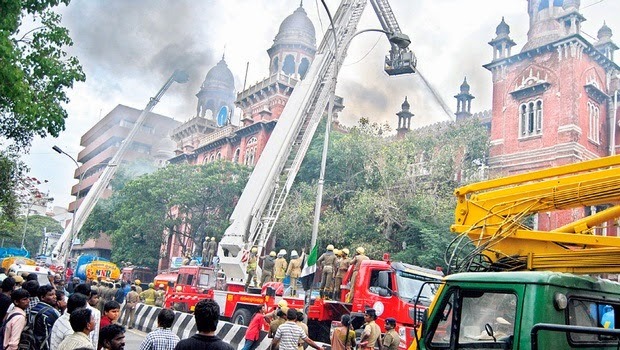 The devastating fire at State Bank of India at Beach road, Chennai has been in news …. fire swept through the second floor of a British-era structure housing the bank in Parrys area. The fire that broke out around 3.30pm was brought under control after five hours, but not before parts of the wooden floor collapsed on to the lower floor. SBI chief general manager said 40 employees were in the building at the time of the accident, but nobody was injured. Firefighters later told TOI that the teak floor made the operation difficult. This is a century old structure – built by Bank of Madras in 1897. The building was designed by Col. Samuel Jacob,modified and adapted by Henry Irwin, and constructed by Namperumal Chetty, a reputed builder displaying Victorian architecture. The bank later became Imperial Bank of India; and in 1955 became the State Bank of India. Today’s TOI has an article on ‘recent fire at SBI raising Qs on safety of lockers’. It states that while all big banks including nationalised and private banks take a comprehensive bank cover that includes the head office as well as the branch network, lockers are not covered under such policies. “As banks don't know the contents of the locker, they don't have an insurable interest (where the insured person derives a financial or other kind of benefit from the continuous existence of the insured object) in the same,”CMD, Andhra Bank is quoted as saying. Simply put: if there is a fire accident or a burglary, you get zero protection as a customer. Standard Fire Policy / property coverage / Banker’s blanket policies all – generally cover assets, cash holdings and securities, including pledged gold for availing a gold loan. Bank’s do not (and cannot) treat the property in lockers as their own or in their custody – and hence do not arrange for insurance. Theoretically, the owner of the property can insure their valuables (be it at house or elsewhere) – all property insurances are ‘location-specific’ and hence declaring that the valuable is at locker at a specified premises is deemed necessary. Even when location is specified, Insurers may not be willing to provide cover – as ‘the value and the presence of the valuables’ at such place can seldom be documentarily established. A well-thoughtout proposal giving all details including valuation of the assets could be a possible solution. Still in the unfortunate event of a claim, establishing the identity of the articles as also them being in such place of loss could prove to be too cumbersome to be proved. In the recent SBI fire, the lockers which were located on the ground floor did not catch fire. – but those having locker facility must read through the conditions which will clearly state that ‘the Bank will, in no way, be responsible / liable for the contents/articles kept in the locker by the hirer’. The banker’s document would also state that in case of theft, burglary or similar unforeseen events, they will initiate action as per law” without holding themselves responsible. They also have the ‘force majeure’ clause for their protection by which they are not liable for any damage due to any cause beyond the reasonable control of the Bank, including sabotage, fire, flood, explosion, natural disasters or other “Acts of God”, war, civil commotion, strikes or industrial action of any kind, riots, insurrection, acts of government, computer hacking, unauthorized access to computer data and storage devices, computer crashes, malfunctioning in the computer terminal or the systems getting affected by any malicious, destructive or corruptive code ……………. b) for those specified items in bank lockers – coverage can be on first loss basis i.e., a list of all articles shall be provided to Insurers – and a % proposed – premium would be charged on the select %age and loss would also be restricted to the maximum of such selected %age.